When I was packing for Italy I told myself to “be real” and not pack clothes that I wouldn’t wear. Now I wish I’d been a lot less real as I don’t have pajamas, sweat pants, a sweat shirt, or more than one pair of running pants. The running pants are the most significant of the things I’m lacking because I’ve decided not to go to a gym and run up our nearby mountain instead – no, it’s not actually a mountain but calling it a hill doesn’t do justice to how much it wrecks me. Technically the run is out of Florence and into a small “mountain” town called Fiesole. 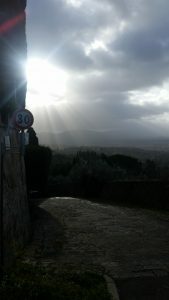 This was taken on the way up the “mountain” into Fiesole. To set the scene picture me bent at the waist gasping for air as I take this shot. Gyms in Florence are not at all what I was expecting, which is to say they’re not like New York. In addition to needing to pay 40 euros at an actual doctor (not the one appointed by the school) to get a form saying you’re fit enough to go to the gym, they’re expensive – anywhere between 180 and 250 euros for four months, and they have extremely limited cardio equipment. Gyms have anywhere from two to three treadmills and one elliptical. So I’ll be running and hoping my legs don’t fall apart. I have two Fiesole specific goals. First, I want to be able to run all the way up the mountain without stopping by the end of the semester. 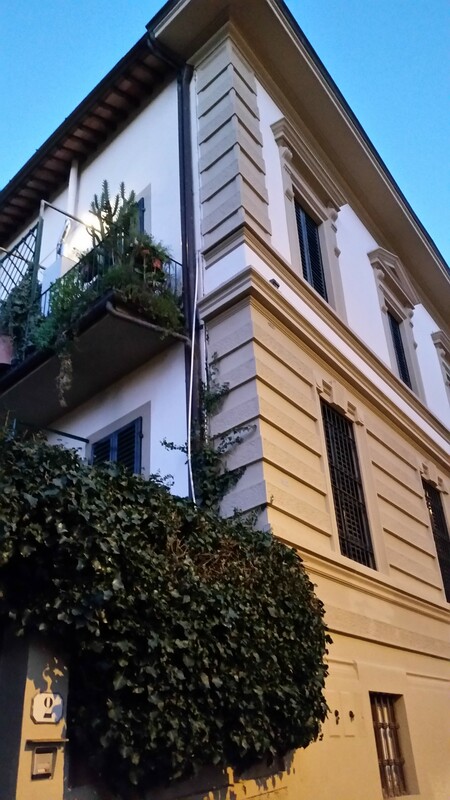 And second, I want to be able to beat my father on a run up the mountain when he comes to Florence in the spring. (Yes, dad, I know you’re reading this. Bring your running shoes). Realistically, I’m not sure if I’ll be able to accomplish either goal, but there they are. The second story comes from Siena, but it isn’t mine, so I wasn’t aware of it until this morning. In Siena, Enzo, Owen and I paid two euros to walk inside the massive Duomo – the one I described earlier with incredible arches and pillars and a ceiling painted like the stars. As Owen describes it, he was filled with awe, feeling closer to God than he’s ever felt before, and was opening his mouth to say some of this to me when Enzo interrupted with a story of how a couple months ago a piece of stone fell out of the ceiling of the Duomo and hit a tourist on the head – effectively killing both the tourist and Owen’s sentiment. I’m both impressed and a little intimidated by Donatella’s boldness. On the first evening she came home and changed immediately into a rose covered track suit. This, I loved. What has startled me recently is that she seems to have no problem going to the bathroom with the door open and (once) coming in while I’m in the bathroom with the door closed. In her defense, I just ran into the bathroom to wash my hands before dinner but I don’t see how she was supposed to know that.